First, we have TWO new Old Bro's joining the tribe, please welcome Damon Anastasia (EpSig 1017) and Gary Harms (EpSig 1197). This brings the roster count for the OBN up to 344 strong. Both of their Vcards have been sent out, please update your records accordingly. Next, we have updated info for Old Bro Vic Hurtado (EpSig 682). 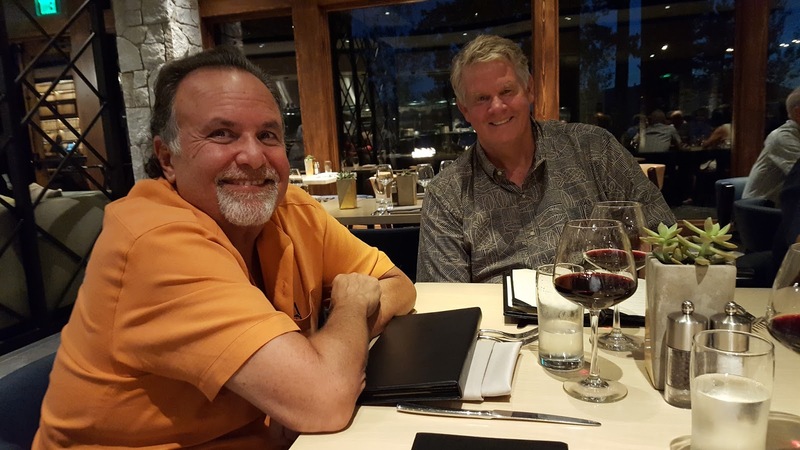 Vic was tracked down in Washington D.C. by Old Bro Greg Anicich (EpSig 681), where they and their wives shared a meal and caught up with each other. Greg got Vic's updated numbers, his updated Vcard has been sent out, again, please update your records accordingly. As always, if you have any new or updated contact info for any Old Bro's out there who are currently NOT on the roster, send it in and I'll get them hooked up. Likewise, if YOUR contact info ever changes, just drop me a note and I'll update your info as well. This morning the OBN received a note from Willy Reese to the effect that Old Bro Jeff Rose (ZE 744) is undergoing a kidney transplant this week. Our thoughts and prayers from the entire OBN are with Jeff this week, more info to follow as it becomes available. On behalf of the current brothers Lambda Chi Alpha-Epsilon Sigma, we would like to invite you to the 3rd Annual Alumni Golf Tournament. 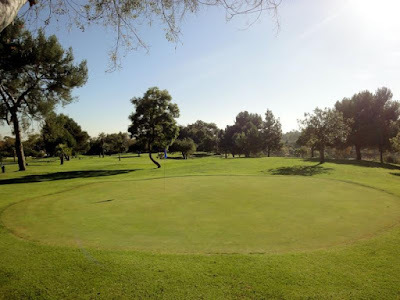 The outing will be taking place on Saturday April 21st, 2018 at Heroes Golf Course in Los Angeles. Last year we saw a great increase in attendance, and we hope to continue this trend again this year. Included in attending the outing is free food and drinks ranging from burgers to beers. To gauge interest of the event, we would like to ask all alumni to please fill out the below Google Doc form regarding the Alumni Golf Tournament. We hope to see everyone out on the course and be sure to bring your A-Game! 2) For you Orange County Old Bro's, you might be interested in attending the "Quarterly Happy Hour" put on by the Lambda Chi Orange County Alumni Association, read all about that HERE. This is not an EpSig specific event, but it's a good opportunity to network and meet some alumni from other chapters who are currently living down in the OC. 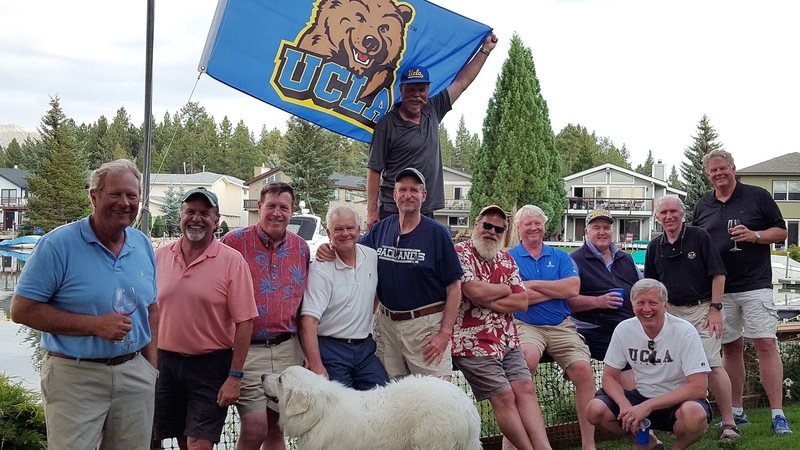 3) For you 70's era Old Bro's, this year's Eighth Annual Tahoe Conclave of Old Bro's is being moved up a week, due to a scheduling conflict for one of our congenial hosts. This year it all happens the weekend of August 17-20. Therefore those of you who have had scheduling conflicts of your own in the past now have NO EXCUSE not to join us. Share a weekend with old friends, including great food & drink, not so great golf shots, and more laughs than you'll have any other weekend this year. Also, this month there has been a flurry of activity within the OBN with respect to the current chapter house and their issues with the national fraternity. One man that everyone in the OBN should know is the High Pi of the house, Greg Wright. His email address is Gjw1801@gmail.com, feel free to drop him a note anytime if you have any questions, comments, etc. about what's going on at the chapter house. the plate ... look at that perfect form ! Finally, once again from the way back machine, another issue of the GREEK TIMES from spring of 1977, including an article about the ALL-U CHAMPION LAMBDA CHI SOFTBALL TEAM .... read all about it HERE ..... Stud of the Week honors once again go to Old Bro Gary Messerotes for sharing these issues. Happy Holidays to all you Old Bro's out there ..... hope that the end of another year finds you all still healthy, happy, full of egg nog, and rarin' to go for 2018. Old Bro Network has been in existence for seven years now, and with support from each and every one of you, we will continue to spread OBN news amongst the tribe in the future. As always, if you have contact info for any Old Bro who is NOT currently on the roster, send it in and I'll get them hooked up. Likewise, if your contact info ever changes, drop me a note and I'll fix that as well. To close out 2017, we have FIVE new Old Bros to add to the tribe, all from the "1400's zeta group", it's great to see some of the new era bro's join the Old Bro Nation. Please welcome Scott Lipman (EpSig 1405), Sean Hunter (EpSig 1446), Ryan Baker (EpSig 1461), Jordan Martucci (EpSig 1472), and James McAfee (EpSig 1492). Special shout out to Robert Frackelton (EpSig 1103) for sending in the UCLA mailing list from the national fraternity, thanks for that. V-cards for the new Old Bro's have been sent out with the latest email blast, that brings to total roster count of the OBN up to 342 strong ..... this all started with contact info on only about 40-50 guys seven years ago, so thanks to everyone for participating and keeping the OBN roster growing. From the national fraternity, the Winter issue of the Cross & Crescent is now out, you can link to that HERE. And, once again from the WAY BACK machine, another issue of THE GREEK TIMES from 1977, courtesy of Old Bro Gary Messerotes (EpSig 644), check that out HERE. Finally, it's never too early to start hinting to your family & friends about what to get you for Christmas NEXT YEAR .... OBN recommends the following, it is without a doubt the most awesome tool you could ever hope for. 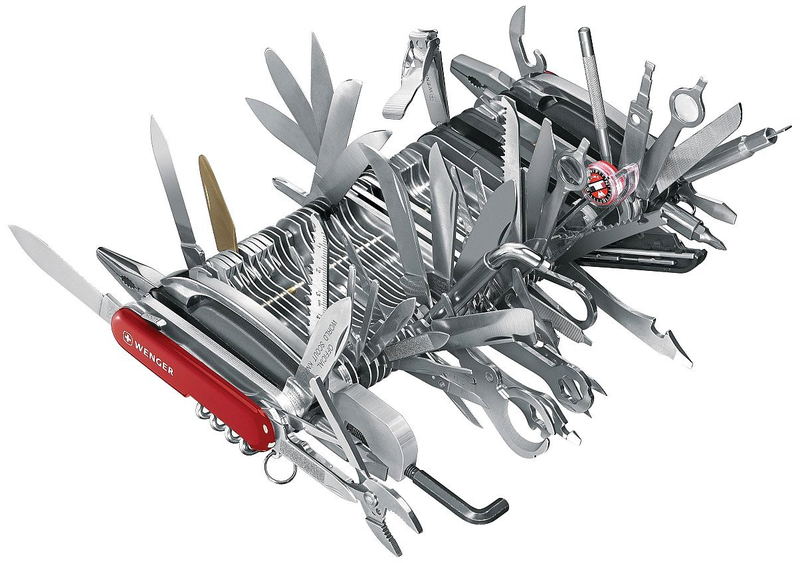 It's the Swiss Army Knife "Giant", you can order it HERE. Yes, it IS a bit pricey, but if you read through ALL of the Product Description (87 tools performing 141 functions !! ), then read through ALL of the Customer Q&A to get an idea about what this baby can do, then read through ALL of the Customer Reviews to get some real world feedback on this incredible item, you will HAVE to have one !! (Editor's Note: The Q&A and reviews are pretty funny, I recommend you DO read them all for a few good laughs). 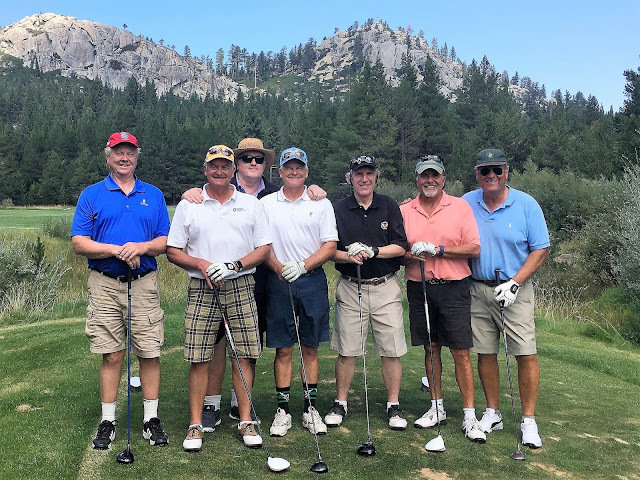 A few odds and ends to tell you about this month in the OBN, there are no NEW Old Bro's to report, but we have updated contact info from our favorite literary agent Lanny Noveck (EpSig 709), as well as from Jim Bonar (EpSig 405). That info has been sent out as new Vcards, please update your records accordingly. Remember, if your contact info ever changes, just drop me a note and I'll get it published and out to the rest of the EpSig tribe. I was looking through old documents in the RR and found a sheet that detailed old traditions the house used to have. I was wondering if you or any alumni you may know would have a scrapbook or documentation of traditions the house used to have. We would love to bring some of them back. Also, I was wondering if you would know where any old composites would be that predate the 1990's. We have been doing some interior renovation and have some perfect spots for composites. Pierson sent me a photo of the "sheet" that he found and it is a page from the "60th Anniversary Collection" bound volume that was distributed in 1990 (see cover at right). 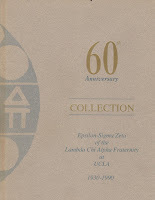 If anyone out there might have an extra copy of this volume, let me know, OBN would like to get it to the undergrads, they are just trying to learn as much as they can about the history & traditions of EpSig and this volume has a great deal of info that would help them understand what it means to be an EpSig. Also, if anyone knows the whereabouts of any old composites, skins, trophies, etc. drop me a note (no questions asked) and let's see if we can get some of these items back to 10918 Strathmore Drive. EPSIG PLAYLIST -- One of the other requests from Tahoe 7.0 was to find out what tunes should make up the all time EpSig playlist ..... which songs did you play at full blast before you headed out to do battle on the IM fields ..... which songs were the ones that ALWAYS got the party started ..... which songs remind you of something at EpSig that is indelibly etched in your mind (and no, I don't mean Mary Sue Barnes). Send me your TOP FIVE TUNES (and why they should be included), I'll compile the list and publish it in a future OBN blog post. Also, the Fall 2017 issue of the Cross & Crescent has been published by the national fraternity, you can see that HERE. 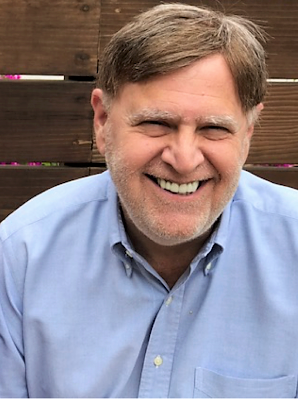 There is an article in this edition about UCLA's own Barry Capello (EpSig 454) and his creation of a scholarship for members of California chapters, read about that HERE. Forgive my bragging about my grand-daughter but It could be of special interest to other Lambda Chis and Alumni of UCLA. The UCLA Alumni Association has awarded our oldest grand-daughter, Corinne Zahlis, a scholarship to study Public Health at the graduate level at our old school this next year. She earned a BA in that field at Tufts University in Boston. Corinne is currently working with a non-profit organization in S.F. to screen and provide glasses for needy pre-school children with visual needs. Corinne’s mother and my daughter, Andrea, is also a UCLA Alumnus, formerly a Little Sister of LXA, a Bruin Belle and member of Kappa Alpha Theta. Corinne’s Dad, Chris, is also a Bruin but a member of another fraternity. up top holding the Bruin flag is Bill Harrison. Photo by John Kohler, which explains why he's not in the shot. 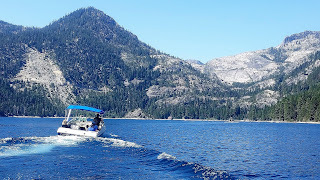 Stud of the Week honors go to Bill Schlichter and Gary Messerotes, they took the photos you see here in this OBN post .... to see ALL of the photos from Tahoe 7.0, click HERE. Perpetual Stud of the Week honors go to John Kohler and Bill Harrison, for hosting us again this year. Rookie Stud of the Week honors go to Jim Lacy, very glad you showed up to join us and hope to see you again next year. Golfing Stud of the Week honors go to Nick Svetcoff, let's see YOU try teeing it up with an artificial hip ..... great job, cart partner. Four legged Stud of the Week honors go to Koda the Great Pyrenees, what a cool dog .... what will you do if you ever CATCH one of those ducks? 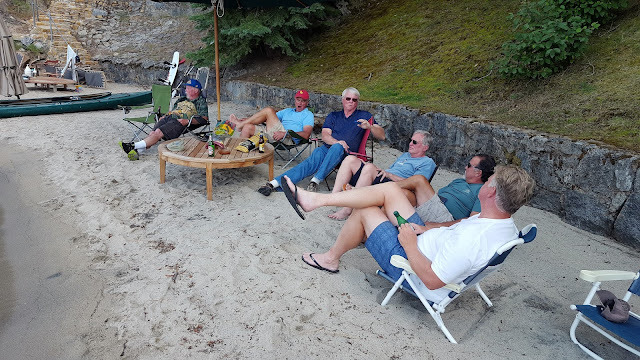 To sum it up, Tahoe 7.0 was another great weekend enjoyed by old friends in a beautiful setting, with great food & drink, great conversation, not so great golf, and much laughter. For all you 70's era Old Bros, mark it in your calendars NOW .... Tahoe 8.0 will be held over the weekend of August 24-27, 2018. 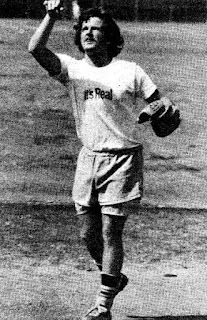 No new Old Bros to report this month ..... Gary Messerotes sent in his new address, a V-card with his new info has been emailed out to all, please update your records accordingly. 1) LAMBDA CHI ALPHA IN A DAY - this event, put on by the national fraternity, will be held ON CAMPUS at UCLA on August 12. Thanks to Old Bro Robert Frackelton for sharing the following links for additional info regarding this event. Lambda Chi Alpha Fraternity changed its normal routine for the bi-annual Leadership conference for 2017. 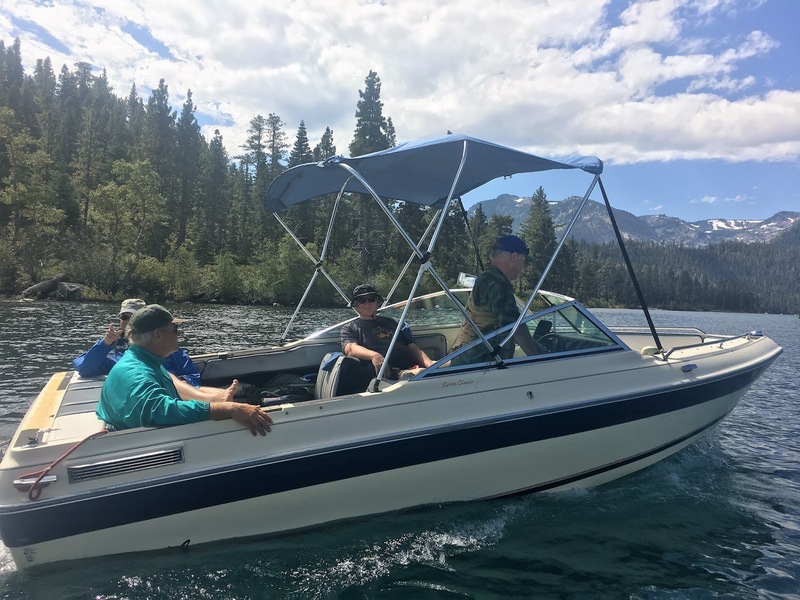 Rather than have a single conference to draw Lambda Chi Alpha undergraduates and alumni for programming and training at a single location, the Fraternity decided to regionalize the conferences. UCLA will be the host site for the Western Region. On August 12, a gathering of undergraduates and alumni is scheduled to begin at 12:00PM and include time with Bill Farkas, the Executive Director, panel discussions and programming. A cocktail reception in planned for 5:30PM. The Purple, Green & Gold banquet follows the cocktail reception. Attire is Business Casual. From a personal perspective, I have actively participated at 16 annual conferences (General Assemblies and Leadership conferences alternate each year) and found the conferences to be of great value in developing a greater understanding of the mission of Lambda Chi Alpha, forging relationships with the leadership teams of the Fraternity for day to day management and the Grand High Zeta as well as interfacing with alumni and undergraduate members from across the franchise. The contacts I have made contributed to my service to our Fraternity, appointment to the Lambda Chi Alpha Properties Board, Nominating Committee as well as selection as an Order of Merit recipient. In short, this opportunity will allow our undergraduate and alumni members to experience a 'snapshot' of how Lambda Chi Alpha distinguishes itself from our competition with cutting edge initiatives and what it has to offer young men as they prepare for life after college. Details are in the attachment. Register at www.lambdachi.org. Hope to see you at UCLA on August 12. Spread the word to your lambchop buddies. 2) FIT 4 THE CAUSE QUADRATHLON - Also happening on August 12, Old Bro Dave Adelman (EpSig 702) is involved with the "Fit 4 the Cause Quadrathlon", an event supporting an organization that brings free fitness and nutrition programs to individuals who need this the most, like low income families, fragile seniors, and at risk children/teens among others. My Lambda Chi Brothers . . .
On July 10th I’m having back surgery. Ouch. As the very proud Chairman of the Board of Fit 4 The Cause (“F4TC”), an IRS-determined 501(c)(3) non-profit corporation, I was planning to compete in F4TC’s first ever QUADRATHALON (bike, swim, run and lift) on August 12th in exchange for your donations. So much for those plans. Urgh !!!! Please help me with my recuperation by clicking on this link and making a tax-deductible donation to F4TC on my behalf. WHY NOT SKIP A LATTE AND GIVE A LATTE? You can learn more about F4TC and its remarkable achievements on my QUADRATHALON page (complete with “thank you’s” for those of you who’ve generously supported me in prior years). Many thanks, in advance. Any donation would be meaningful. Many Old Bro's have already contributed to Dave's cause, but he still needs our help to reach his fundraising goals for this worthy endeavor. Peel off a few bucks, whip out your favorite VISA card, whatever you've got .... help an Old Bro help others (always a great idea). 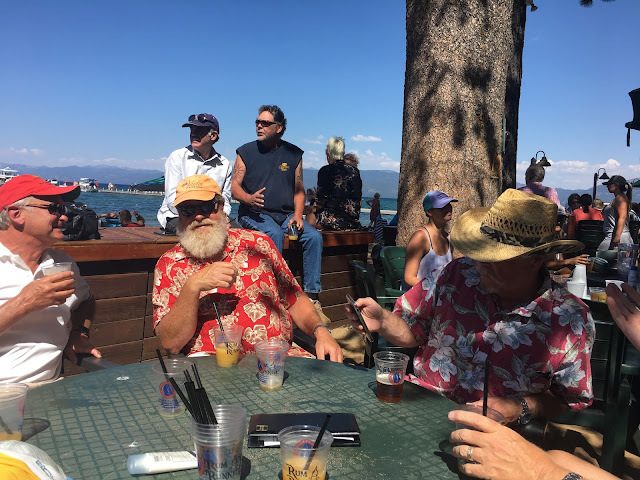 TAHOE 7.0 - For all of you 70's era Old Bros, the seventh annual gathering in Tahoe is ON once again. 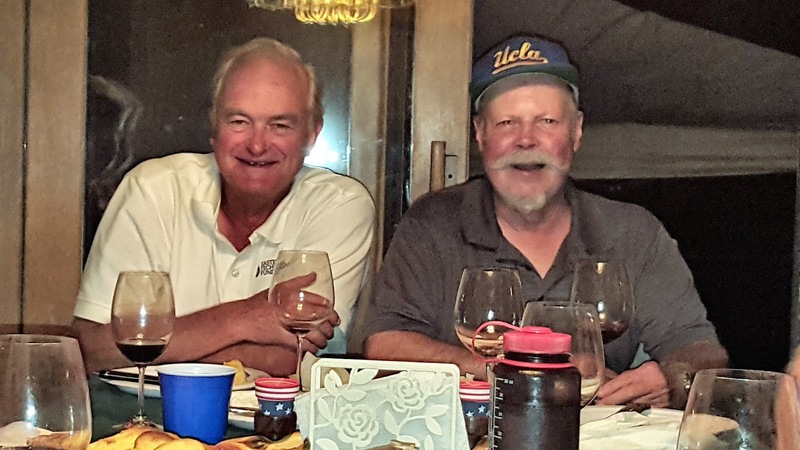 Old Bros Bill Harrison & John Kohler will once again play congenial hosts, and several Old Bros have already confirmed they will be on hand for the celebration. This is always a great weekend of catching up with old friends, and I strongly suggest you consider joining us if you can. Generally speaking, the festivities will commence Friday, August 25 and continue throughout the weekend. If you are interested in attending, drop me a note and we will hook you up. 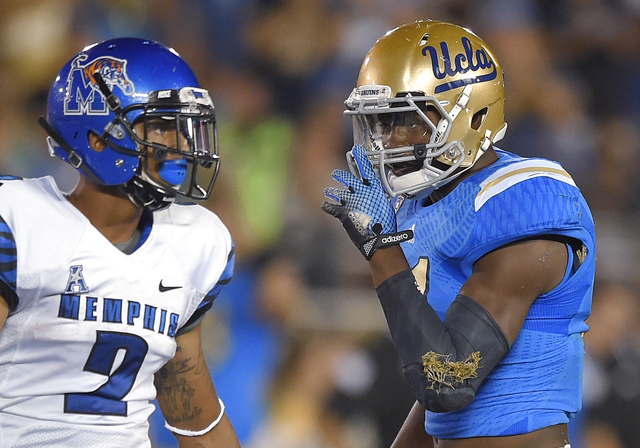 4) UCLA BRUINS AT MEMPHIS (Football !!) - Many Old Bros have indicated an interest in attending the game at Memphis on Saturday, September 16 (11 AM local time start). Sorry, Elvis won't be there, but you CAN visit Graceland as part of the trip, and also head down to Beale Street for some good old Memphis blues and barbecue. Feel free to use the Old Bro Network to let others know you're going to the game, just make sure to send in some photos of your trip !! As always, if any of you Old Bros out there have any other News & Notes items you would like to see published, send me the info and I'll get it pushed out to the entire tribe to enjoy.